Welcome to another edition of Quick Tip Tuesday. So, you want to become a freelancer writer, huh? And you don't have a ton of experience or writing samples? 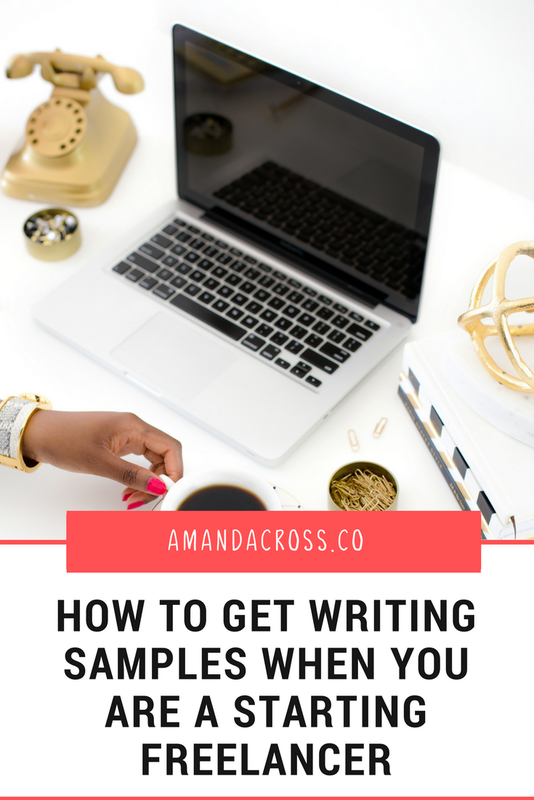 Before you jump in head first, let's chat about how to get writing samples when you are a starting freelancer! There are many ways to get writing samples even if you are a total newbie in the space of freelance writing. In a perfect world, you want to make sure that any writing samples you do have are attached to your name, especially if you plan to be a ghostwriter. You can't claim ghostwritten pieces, so you need content outside of those pieces so you can get more ghostwriting opportunities. Here are some ways to get writing samples so you can start your freelance career off on a great foot. One of the ways I get writing samples is through my blog. I have been blogging on the internet since 2011, so I often use my content from The Happy Arkansan when I apply to write for sites that are college and lifestyle related. I used to create content under a blog named Amanda Cross Blog, but I shut that down this year. When I had the blog, I used that as proof that I had writing samples. Now that I have started creating content as Amanda Cross Co., I am going to be sharing this content when I am applying to relevant writing jobs. Create a blog in a similar niche as what you will be writing for as a freelance writer, especially if you are creating the blog to get writing samples. There is no use in having tons of pieces you can't use because they aren't relevant to the jobs you are applying for. A well-done and advertised blog can also be fantastic social proof that your content works. If you can get hundreds of social shares, a lot of comments, etc. it shows that your work matters to people. This means that your content is excellent and that it could get similar results for your client's blog. Make sure that you showcase those pieces with a lot of social proof when pitching your talents for freelance jobs. Let's chat about the second way to get writing samples: guest posting. Once you have your writer website in order, reach out to a few select bloggers in your niche to see if they would like a guest post from you. To get writing samples from guest blogging, you need to provide a valuable pitch for their website. Start with my favorite site BuzzSumo. By default, you will have access to the most shared posts from your potential guest post site in the last year (you can pay to get access to more, but it's a bit pricey.) Check out what is being most shared. See how you can add to the content or create related content. Read through those post to get a feel for how the writer writes. Dig through their archives to see what kind of content they are missing. From the results and the digging you do on the blogger's website, you could then pitch a few post options that would look great in your portfolio as well as on their website. This is a win for everyone! When pitching your guest blog, make sure you treat them with respect. Don't use the same pitch for multiple bloggers, address them by their name, and respect their time. LinkedIn Pulse is a great option if you want to get writing samples. Many business professionals utilize the LinkedIn Pulse platform even when they aren't trying to get writing samples. The issue with LinkedIn Pulse? This isn't the place for practicing your writing skills, y'all. This is a professional website where you could meet real freelance writing client leads. The work that you publish on LinkedIn Pulse should always be your best work. It needs to be proofread and beautifully done. You may be able to get away with poorly done content on your blog, but you need to be on your P's and Q's when you are sharing content on LinkedIn Pulse. Last, but not least, to get writing samples you want to create mock content pieces. You don't want your entire portfolio to be made up of these simulated content pieces, but they can work in a pinch to get more freelance writing samples if you don't have any at all and you don't have a place to put up content online. Create a few mock pieces related to the jobs you want to apply for. Create about 2-3 pieces that you can attach when you are pitching companies or applying for jobs on sites like Upwork. The purpose of samples is to show the work that you can do. Obviously, in a perfect world, these pieces would be published, but they don't have to be to get your first couple clients. Then hopefully over time, you will be able to showcase published writing samples. Writing samples are vital to getting the freelance jobs that you want. Your potential clients want to know that you can write the content that you say you can. I hope that today's article has given you some insight into how you can create these writing samples for your freelance career. Will you be producing any writing samples this week? How will you write them?